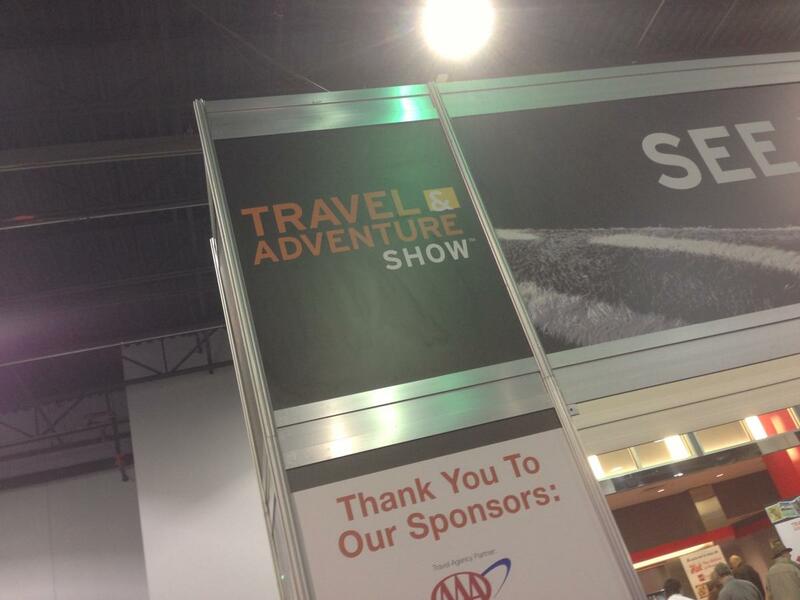 Last weekend, I picked up Travelmista at the ORD and we went to The Travel and Adventure Show in Chicago. It was held at the Donald E. Stephens Convention Center which is almost next door to ORD. We arrived at 1pm and it was packed! It must have been with all the cold weather we were having everyone was dreaming of vacation. The cost was $9 per person and parking was $13. The show still has dates in the Bay Area/ Santa Clara- Feb 16-17, 2013 and Washington DC- March 9-10, 2013. The show was organized by different locations in the world which was extremely helpful. I didn't know what to expect but there were lots of tour operators selling vacations. Group travel is not my thing so I was disappointed in the number of tours operators at the show. The best selling line of the show was "To hold the price down, we take public transportation!" OK fine but don't tell me the tour cost $3,000 to take public transportation. Now I know for some people tour groups is the only way they feel safe to travel and they like historical commentary. But you could get the same information from downloading Rick Steves apps and listen to them at your pace. There was lots of good brochures and information on local travel. There were vacation raffles but I don't think I was lucky on the big items. But I did win a GoGo scarf! There were lots of things to do with kids at the show: indoor snorkeling, segways, cooking shows, dance shows. We sat through Chris Harrison who is the host of the Bachelor presentation. He mostly talked about the show with a couple of caveats about the travel locations. Since I don't watch these shows I had no idea who he was talking about. But the real reason we attended was to see Rick Steves. He was our tour guide during our Mediterranean Cruise with Rick Steves Mediterranean Cruise Port Book. Available at Amazon We love the book and found listening to the apps while traveling fun and easy. You can download his apps from itunes for free. (much cheaper than a $3000 tour) His afternoon talk was all about Italy which we visited back in October. He gave lots of insight into how he travels and as you would expect was a great public speaker. After the talk he signed books which is how I got my Rick Steves book signed. Look, it is Rick Steves! London for Valentine’s Day- Always a good idea!